Join Pastor Kwen for Bible Study on Friday afternoons at 1pm in the Multipurpose room. 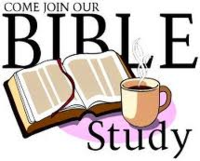 Join the men of Trinity for Bible Study on Wednesday mornings at 6:45 a.m to discuss the upcoming week's lectionary texts. Join us on Thursday mornings at 8:00a.m. in Room 104. Contact Nora Lee at 665-8113 for any questions.